This article is about the level from Donkey Kong Country Returns 3D. For the Yoshi franchise game, see Yoshi Topsy-Turvy. Topsy Turvy is the fifth level of the secret Cloud world from Donkey Kong Country Returns 3D. It represents the fifth world of the game, the Forest. The main mechanic of the level is the platforms that constantly rotate 360 degrees to the beat of the level's background music, which are used to progress through the level. Heading right, Donkey Kong and Diddy Kong will immediately find Skittlers and two rotating rectangular platforms. Beyond the bouncy mushrooms are more rotating platforms. Unlike the previous ones that remain available for use as platforms when rotating, these platforms are flat and can only be stood on when in a horizontal position, but not when vertical. The Kongs must time their jumps to traverse the pit. After that, the Kongs can use the rotating platform (when vertical) to climb the grassy ceiling to collect Bananas and cross the bed of spikes or simply jump over it. A yellow button then must be pounded several times to reveal the next area in the background, as well as a Barrel Cannon leading to it. Past the first checkpoint are four flat platforms, with the latter two rotating at different times to the former two. Here, the Kongs must make quick jumps to get across. After the bouncy mushrooms are two rectangular platforms, but this time, their longest sides are covered in grass and they rotate more frequently. They must be used to cross the wide bed of spikes and to reach an area with multiple flat rotating platforms with Tiki Torches between them. Two bouncy mushrooms lie past the pit (The circling Bananas between them can be collected to reveal a 20 Banana Bunch), as well a much wider flat rotating platform. Another yellow button past the platform (which must be pressed three times) reveals a wider grass-covered rotating rectangular platform (which also rotates less quickly and frequently), and the next checkpoint. The Kongs must reach the top of a vertical area using the fast rotating rectangular platforms. At the top, the Kongs must climb the ceiling grass and jump on a variety of rotating platforms to cross the spikes and pit. At the cave's exit, there is a wall of grass which leads to many more previously encountered rotating platforms as well as Tiki Zings. Here, the Kongs must carefully time their jumps to reach the top-right stationary platform where the Slot Machine Barrel is located (There is a Barrel Cannon located at the bottom-right just above the pit that leads back to the cave's exit should the Kongs fall off the platforms). The Kongs must use the second set of rotating platforms in the level to climb up a grass-covered wheel to reach a Barrel Cannon leading to a Bonus Area. Here, every item must be collected to reveal the Puzzle Piece using the many platforms. Just to the left of the first checkpoint are two rotating platforms each with circling Bananas above them. The right circle of Bananas reveals a Banana Bunch when collected, while the left one reveals a Puzzle Piece. On the left of the bed of spikes under the fast rotating rectangular platforms is a small area obscured by leaves with the Puzzle Piece. In the area with flat platforms and Tiki Torches just after the aforementioned bed of spikes, the Kongs must blow into and defeat all of the enemies while avoiding falling into the pit to make the Puzzle Piece appear. Just before the second checkpoint, the Kongs must use the wide rotating platform (while vertical) to climb on the grass in the ceiling and hit the plant on the right to reveal the Puzzle Piece. 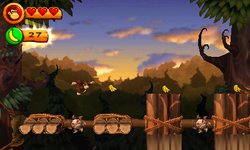 At the top of the vertical area with rotating platforms after the second checkpoint, the Kongs should head left to find a leaf-covered area with the Puzzle Piece as well as Bananas and Banana Coins. Beneath the last rotating platform before the Slot Machine Barrel is a plant containing the final Puzzle Piece. This is the second level in Donkey Kong Country Returns 3D with platforms that move to the background music, the first is Music Madness.